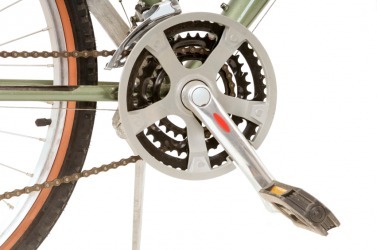 The function of this pedal is to move the bike forward. The definition of function is the normal action of something or how something works. An example of function is how a bike is pedaled forward. Function is defined as an assigned duty or position within a company. An example of function is a mail room attendant. Function means a formal event or ceremony. An example of function is a company Christmas party. "function." YourDictionary, n.d. Web. 24 April 2019. <https://www.yourdictionary.com/FUNCTION>. An official ceremony or a formal social occasion: disliked attending receptions and other company functions. b. A rule of correspondence between two sets such that there is exactly one element in the second set assigned to each element in the first set. Also called mapping . To deal with or overcome the challenges of everyday life: For weeks after his friend's funeral he simply could not function. A relationship between two sets that matches each member of the first set with a unique member of the second set. Functions are often expressed as an equation, such as y &equals; x &plus; 5, meaning that y is a function of x such that for any value of x, the value of y will be 5 greater than x. These nouns denote the actions and activities assigned to, required of, or expected of a person: the function of a teacher; a bank clerk's duty; assumed the office of financial adviser; the role of a parent. ​An official or social occasion. From Middle French function, from Old French fonction, from Latin functionem, accusative of functiō (“performance, execution”), from functus perfect participle of fungor (“I perform, I execute, I discharge”). The special action or physiological property of an organ or a body part. In the sense he can function but the memory is probably gone for good. But that, too, is a function of present technology. Tests revealed normal brain function, and there was no indication of any permanent damage. She didn't understand how humans could feel so much and still function when she was overwhelmed.